KANSAS CITY, Mo. 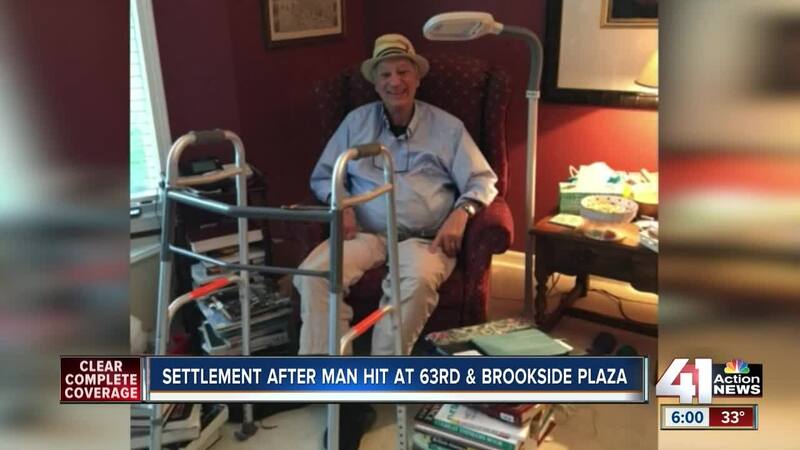 — The city has agreed to pay more than $300,000 to a man who was hit by a car at a Brookside intersection in 2016. His attorney said Wednesday the lawsuit wasn't about the money. They wanted the city to make the area safer. The drastic change to improve pedestrian safety at 63rd and Brookside Plaza came last Spring when the city installed a HAWK signal at the crosswalk. The signal lets pedestrians press a button and wait for traffic to stop. The light didn't exist three years ago when a car hit Steven Israelite as he was crossing 63rd street to go to Panera. "He had looked before he started to cross as he left the curb in front of the Michael Forbes restaurant," Stephen Gorny, Israelite's attorney said. The driver told police the morning sun blinded her. The impact damaged Israelite's spine, legs and wrists. He later suffered a stroke. As Israelite recovered, his attorney filed a lawsuit claiming the city was negligent for failing to implement safety measures at the intersection. "When we were investigating the situation after he was injured, we found there were a number of collisions at this intersection," Gorny said. The city is now on verge of paying out $310,000 to settle the case. But even with the added signal, 41 Action News witnessed Wednesday some pedestrians ignoring it, while others didn't seem to know how to use it. Others were in a rush and one person was trying to be courteous to drivers. "I didn't want to mess up traffic when I'm driving through her - it's kind of a mess," pedestrian Christi Miller said. "If it's busy or if I have my child with me, I don't mind hitting the button that's fine." As for the person instrumental to this fix? "He still has not come down to see it just because he does not want to relive being down here, but he is extremely pleased that the light was placed," Gorny said. The city council will vote on the settlement Thursday.